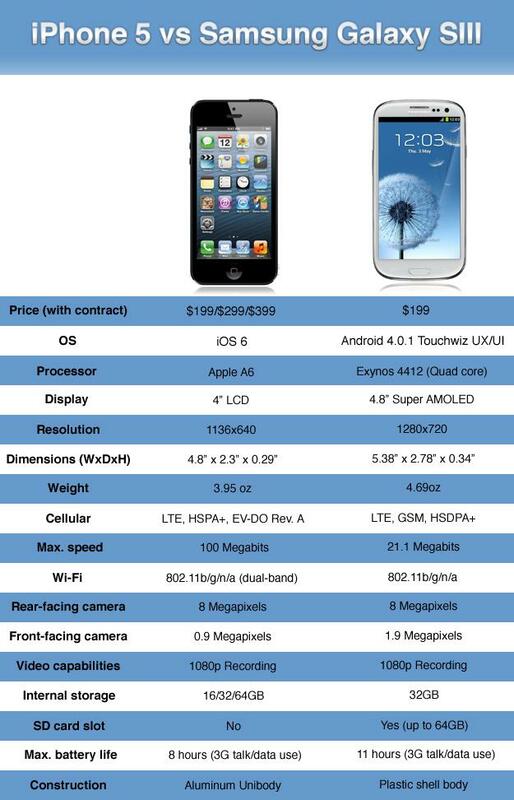 iPhone 5 vs. Galaxy S3 Comparison : Which is the Better One? Apple and Samsung are two ultimate leaders of Smartphone industry. These two mobile developers are involved in lots of permissible battles all around the planet. Apple has launched its new iPhone 5 that is seen as the major rival of Samsung Galaxy S3. Which handset comes out on top? To get the answer, let us compare features and specifications of these two. We are also covering iPhone 5 vs Nokia Lumia 920 Comparison, don’t miss that post as well. To compete with Samsung, Apple comes with large and wide display. The iPhone5 has 4” display and Galaxy S3 is popular for its wide 4.8” display. The selection of display depends on how big piece you want to slot into your pocket. 4” LCD display of iPhone 5 is quite big for video and gaming experience. However, Galaxy S3 has a wider Super AMOLED 4.8” screen that can enhance the gaming experience even more. Apple’s newly launched iPhone 5 is incorporated with faster dual-core A6 chip processor. It is a biggest hit over the 1GHz of the iPhone 4S. A6 processor has incredible speed with multi-tasking ability. On the other hand Samsung Galaxy S3 runs on quad-core Exynos 4 processor at 1.4GHz. So, as far as speed is concern, Apple iPhone is a leader among two. Galaxy S3 runs on smart Ice Cream Sandwich Android 4.1 OS. According to some sources, Samsung is going to get Android 4.1 Jelly Bean in future to compete with Apple’s new iOS 6. It is quite hard to say that which one gives smoother and faster performance. It somehow depends on personal choice of users. But in our eyes Apple iPhone is comparatively more seamless. Both devices have 8-megapixel primary camera along with HD video recording at 1080p. However, sapphire lens, optimized five-element, Panorama, etc. are some features of iPhone 5 which can make significant difference. Both Galaxy S3 and iPhone 5 come with 1GB RAM. Both handsets are offered with up to 64GB storage. The Galaxy S3 supports micro SD slot to expand the memory up to 64GB. However, iPhone has iCloud software that allows vast storage facility. So, the choice depends on the personal taste and requirement of the users. The iPhone 5 is a thinner and lighter Smartphone in comparison to Galaxy S3. The weight of iPhone 5 is 3. 95oz and Galaxy S3 has weight of 4.69oz. Although, iPhone 5 is there at different rates for different versions, it is seen that this Smartphone is available somewhere around Rs. 42000. On the other hand the best price of Samsung Galaxy S3 in India is Rs. 34999. It is fairly complicated to choose the best one as both Smartphones have their own characteristics and features. Galaxy S3 has wide screen and a long list of features with a low price tag. On the other hand, iPhone 5 has plenty of advanced features with improved software. If you love to enjoy incredible speed with great internal storage, Apple iPhone 5 is the best pick for you.